Welcome to the wonderful world of fish finders! You have landed on the right website if you are in search of the very best fish finder available today that’ll make your fishing experience easier, joyful and more effective. This is your one-stop destination to learn everything you need to know about fish finders and information about fishing in general. Fishing is so much more than just packing your rods and reels and head out on the water to catch fish. One way of making your fishing experience efficient is to use a fish finder. I’ve been a fish fanatic for over 20 years now, and I have owned many fish finders that have served me well and others that have not. Below is my fish finder comparison list that I compiled as a result of owning and using fish finders over the years. Color Screen or Gray Scale? The great thing about the Garmin Echo 551dv is that it includes all the advanced features that you will need in order to improve your fishing. This unit is one of the best to use in deep waters. The 500W RMS transmission power allows the sonar to reach deep down the waters to an impressive depth of 2300 feet. The transducer is equipped with dual beam sonar with 77kHz / 200khZ and dual frequency of 50kHz / 200khz. Featuring a 5 inch, VGA color display with 480×640 pixel resolution that provides you with clear and bright images. Reading data from the screen is easy and you are able to clearly distinguish between all the different details below the water surface. For example how the bottom is formed, different structures and of course the fish arches. One of the greatest elements of the Garmin Echo 551dv is undeniably the DownVü technology. The DownVü maximizes the sonar ability by using high rate frequency that will provide you with picture-perfect images of the underwater activity and structure. You can then use the split-screen function to view two different sonars at the same time, providing you with stunning detail of the area below your boat. 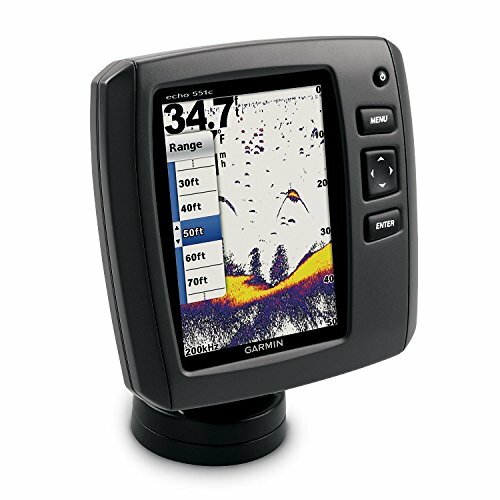 All in all, the Garmin Echo 551dv is an advanced fish finder device with a lot of useful features. It is very easy to install, portrays clear and stunning picture-like images on screen and is waterproof, so you don]t need to worry about the performance of the device in heavy rain or rough seas. It provides you with the newest technology in identifying fish, sonar clarity, and increased visibility. The Helix 7 SI is a major jump in technology from the 5 series and you will experience bright, clear, fast and great detail images on a fantastic 7-inch widescreen glass display with 480×800 pixels resolution that operates from 150 to 1500 feet depth range. The Helix 7 SI GPS features DownScan imaging, Side-Imaging and SwitchFire sonar technology and with the easily readable 7-inch screen, the split-screen function becomes extremely handy where you can view different information side by side (DSI, SI or SwitchFire data). With the SD card slot, you are able to use your preferred charting options such as AutoChart, AutoChart Pro or Navionics mapping. One of the greatest features of the Helix 7 SI is the revolutionary Side-Imaging innovation that will give you 180 degree side-to-side view of the underwater activity and structure. In conclusion, having a big 7-inch glass screen, Side-Imaging technology, DownScanImaging technology, SwitchFIRE and GPS, makes this fish finder worth every penny. Other brands with same features will cost a lot more so if you are trying to find an effective fish finder, Humminbird Helix 7 SI GPS might be the perfect fish locator that fits your fishing style and needs. Next up is the Striker 4 from Garmin and here we have a super simple and portable design that fits perfectly in the palm of your hand. Despite its portability, it is packed with everything you need in a fish finder. 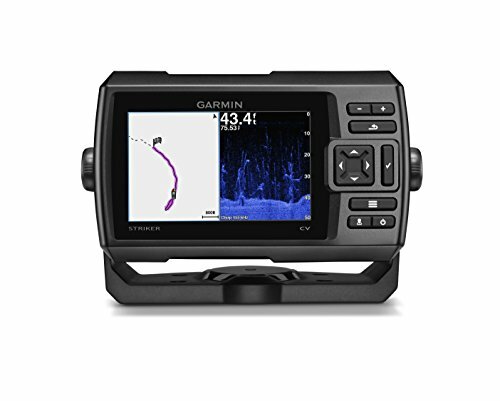 The latest sonar technology from Garmin, called the CLEARVÜ, was designed to provide you with additional information, giving the ability to see both below and around the boat. The CHIRP sonar fires out sonar frequencies that bounce back from the objects that they hit and deliver back a wide range of detailed information about every item below and around your boat with much better target separation.Therefore, the CLEARVÜ scans the area around your boat to give you a complete picture of all the area around you. The Striker can deliver photo-like images with all the important elements that you need to know of under the water. The package includes a simple interface that features buttons that are easy to use, install and operate. 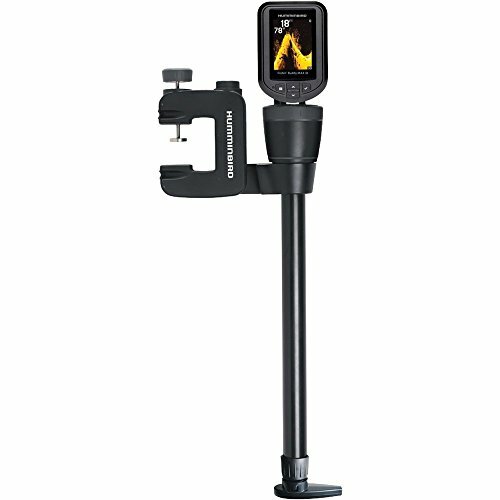 This unit features a 3.5″ inch display, and if you are looking for a bigger screen in the Striker family, you can also purchase 5″ and 7″ fishfinder. Moreover, this unit features waypoint map that you can use to navigate, view and save any locations. This is very handy if you want to save a spot that you might want to revisit later on. Consumers that were looking for a portable fish finder are overall very impressed with the quality of images that are displayed on the screen. If you have detailed visual information about everything below the boat, you will have abetter understanding of locations that you should avoid and therefore, it will be easier to spot areas with a lot of activity. Moreover, current owners are thrilled with the CLEARVÜ sonar that can spot any bait hiding in dirty water or carefully hidden next to rocks. Overall, this is a compact and efficient fish finder for those who are making their first step in the fish finder industry. This is the perfect unit if you are looking for something portable, simple and something that includes most of the latest technology to find fish. Have a look at the Striker and see for yourself if this unit can match your demands. Moreover, there is the ability to zoom in and out in both settings. On top of that, you can also program the device to split the screen and view the DI sonar and the broadband sonar alongside each other. The Echo comes with a 5″ screen that offers 480×640 pixels resolution. You can mount it almost anywhere on your boat because of its portability, and it comes with an ergonomic clamp. Using the Fishin Buddy provides your with the liberty of being able to use it anywhere, regardless if you are fishing onshore or offshore. Moreover, you don’t even have to use a boat to benefit from this unit. The Fishing Buddy features a 3.5″ Color TFT LCD that delivers excellent readings of the bottom structure, objects, and fish. Additionally, operating the fish finder is an easy one-touch control. There’s a transducer tube that you can extend to up to 40 feet, and you can retract it to 24 feet to meet your needs and store it easily. The Fishin Buddy provides the convenience of not having to rig, wire or mount a transducer because there is one such built-in. This fish finder has been receiving raving reviews all over the internet, and it is hard to find any negative comment about the Fishin Buddy. Having said that, if you are looking for a portable but durable fish finder that you can mount on any boat or kayak, then I urge you to have a further look at the Fishin Buddy from Humminbird. This is the mighty Dragonfly 7 Pro Raymarine and here webasicallyhave a technological wonder, but also an extremely user-friendly fish finder that was built to find you a lot of fish and enhance your fishing and outdoor experience. This spectacular device features the latest innovation in CHIRP technology, and the Dragonfly 7 Pro is among the most widely recognized and favored fish finder that you can find on the market today. This is a unit that is all about a sophisticated sonar systemand it will highlight all the information that you need to know and also display important data of the most remote areas of the water. 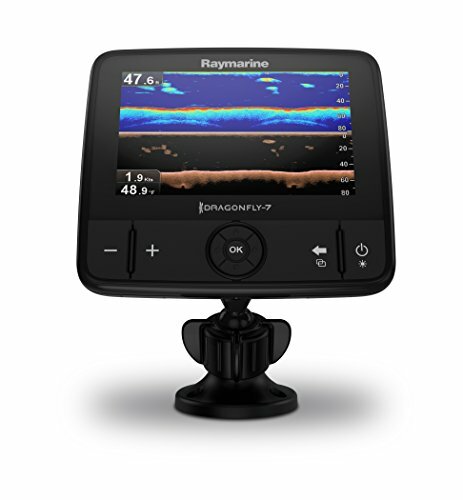 The Dragonfly 7 Pro is awinner in all aspects, and apart from its innovative CHIRP technology, the device also comes with the latest DownVision engineering from the Raymarine team. The popular DownVision element can identify every single movement below the water surface. Once the fish finder has identified even the tiniest movement, you will be able to read all the data on the display clearly. This unit is also compatible with Wi-Fi. Therefore, you can sync the fish finder to your smartphone or tablet and read all the necessary data from any of your Wi-Fi devices. Using the Dragonfly 7 is like taking your fishing to a whole new sonar level. Not only by employing the awesome Spectrum CHIRP Technology but also the CHIRP DownVision technology that is going to deliver stunning graphic images of the structure and objects on a scale that you have never witnessed before. Overall, current owners are extremely happy how the DownVision feature delivers underwater sonar images that outperform every fish finder in this price range. Moreover, you will be amazed by the superb deep water efficiency that the Dragonfly Pro 7 offers down to 600ft with extremely accurate bottom track. The Dragonfly 7 comes out of the box with built-in GPS and Navionics mapping. If you are looking for a sophisticated fish finder to use efficiently in deep waters and a unit that can cover even the smallest movement, then have a look at the Dragonfly 7 Pro because this is probably a candidate to be the very best finder that you can invest in. Our last item on the list is the Helix 9 from Humminbird. Here we have another brilliant fish finder that has a TFT 9″ display that provides 800×480 pixel resolution that delivers a bright, crystal-clear readings. The awesome thing about the display is that you can read from the display even in bright daylight thanks to its LED backlight. The screen is huge, and this is not a unit for those who are looking for a portable fish finder to store in your pocket. This unit features the famous and powerful dual Beam Plus sonar. By having the ability to use the Dual Beam Plus sonar together with the Switch Fire technology, you are gaining an edge over your fellow anglers because you will have a monster machine that delivers up to 4.000 watts of PTP power output. The Helix 9 features a built-in GPS that will pinpoint your exact location and to navigate to your favorite spot. The GPS feature allows you to save your current location so you can revisit the spot later on. Moreover, there is a dual card reader so you can safely store all your maps and previously stored hot-spots on SD card. As soon as Humminbird releases a software update, you can easily download and stay up-to-date and enjoy all the latest features. Overall, the Humminbird Helix 9 Sonar GPS allows you to use GPS maps and sonar images side-by-side on the 9″ display. This model has received positive reviews online, and anglers are thrilled with the super bright LED backlit display. Moreover, the Dual Beam Plus sonar, along with the Switch-Fire, work together to bring you an industry-leading machine that delivers a whopping 4000watts of power. If you have enough space on your boat and if you are looking for a sophisticated fishfinder that features all the bells and whistles of a technological wonder, then have a look at the awesome Helix 9 Sonar GPS and see for yourself if this is a unit that meets your demands. The Elite 5 HDI fish finder comes in a sophisticated but simple design and brings together the very best of Lowrance technology into one astonishing fish finder set. It has a power output of 250 watts RMS and 30000W PeakToPeak that will work down to 1000ft at 50 kHz. Featuring a 5 inch, 256-color TFT display with 480×480 pixel resolution showing you clearly everything you need to see below your boat. You can even enjoy the split screen function where you are able to split the screen into 3 panels. With the DownScan Overlay, Lowrance has taken the Down-Scan Imaging technology to another level. Using the best of both, you will accurately spot fish and also spot how the bottom is formed, the structure and plants/trees in great detail. You will easily locate your position quickly with the built-in GPS that features pre-loaded US map with over 3000 rivers and lakes that show depth contours. For you guys that prefer to fish in large widely open water, this fish finder should be your selection because it provides high performance both as a GPS unit and as a fish finder that will fit both beginners and more experienced anglers. Here we have one of the fish finder beasts from Lowrance that was literally designed to impress you. It is packed with features and incorporates industry-leading fish finder technologies and most recent breakthroughs in navigation into one user friendly, 12 inch multi-touch device. The HDS Gen 3 features many groundbreaking Fish finder options such as the multifunctional display with Superior Lowrance Target Separation, fast interface, and Full System Control. Using the large 12-inch LED-backlit wide-screen display with incredible detail resolution, it’s possible to read every piece of information needed effortlessly. It offers a lot of beneficial conveniences to have a touchscreen interface and with the HDS 12 Gen3, you’ll experience ease of access to all the sophisticated highlights when you need it. Despite being a touchscreen device, it additionally comes with the standard physical control keys. It has built-in Wi-Fi so you can hook the fish finder to your smartphone or tablet using the GoFree app and control every move wirelessly. One of the most impressive functionality of the HDS 12 Gen3 is the incredible underwater visuals of the bottom structure and objects that the device is capable of generating. To provide this stunning graphic, Lowrance has incorporated the DownScan Overlay. This technology takes the DownScan Imaging and overlays it on the CHIRP Sonar. Another useful addition is the TrackBack feature that you can use to rewind any sonar data to analyze further or even chart down hotspots or other places you might want to revisit later on. You will be able to read sonar data at a level you have never experienced before. It is stuffed with more highlights than any predecessors and based on all the technological wonders, it is safe to conclude that the HDS 12 Gen3 is a well-deserved all-around champion of the Fish Finders available today. The Garmin Echo 101 is one of the best portable fish finders out there and what makes this fish finder among the most popular ones is how budget friendly it is, making it one of the cheapest fish finder that money can buy. Although it is cheap, it doesn’t mean that it’s not packed with features. It comes out-of-the-box with powerful sonar and crystal clear and readable screen so you can sit back and relax while the Echo 101 detects the activity below your boat. It has powerful 1600W sonar that works down to 1500 feet that will enable you to identify fish, structure and weeds easily and effectively. Featuring 4-inch grayscale display that shows clearly the sonar data. The screen is big enough to easily read data from and compact enough to ensure its portability. One of the greatest features of the Garmin Echo 101 is the HD-ID technology that provides you with excellent target separation. 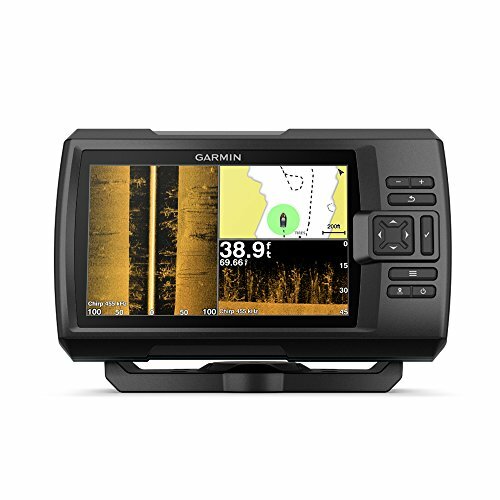 Being one of the biggest brands in the fish finder industry, Garmin ensures high quality, compact design and extremely appealing price range compared to other fish finders. The Echo 101 works extremely well to provide data on depth, temperature, structure of the bottom and most of all identified fish! 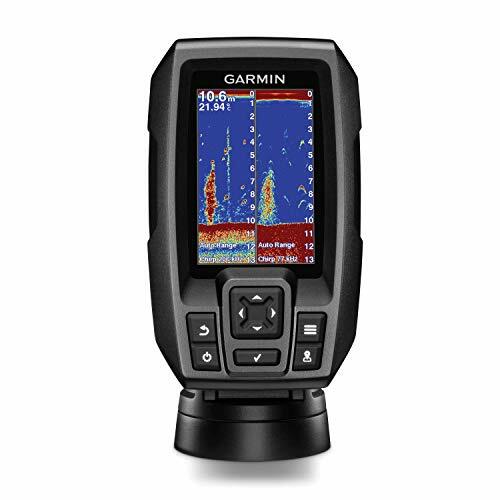 The bottom line is that the Garmin Echo 101 performs extremely well as a single beam unit with the industry standard 200 kHz frequency and a max depth of 1500 feet that is much more than many of its competitors. Also, you are covered with Garmin’s 1-year hassle free warranty if you experience any problem with the device. The Humminbird 597 ci HD DI ensures that you’ll clearly see whatever you need to see underwater using the powerful 455/800 kHz Down-Imaging sonar and the 200 kHz down-beam sonar. The 200kHz sonar frequency is perfect for those who want to fish in shallow – medium deep water and with the Down-Imaging technology you will be able to see on the screen structures, objects and plants down to 250feet in stunning detail. 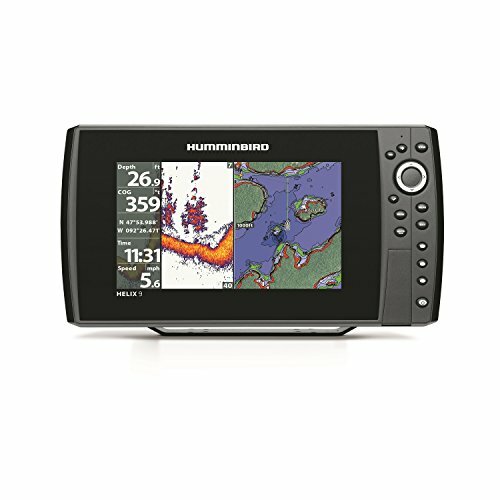 Humminbird understands that you will need a lot of power to operate all the advanced features such as Selective Fish ID+, Switch-fire Sonar, split screen zoom, freeze frame and split screen bottom lock and to make sure your device will operate flawlessly, the 597ci HD DI comes with the power output of 500W RMS and 4000W Peak-to-Peak. All the graphics will be beautifully portrayed on the 256 colors, 5 inch bright color screen with 640×640 pixel resolution. With the LED backlight technology you can view the screen perfectly at any time of the day, in bright sunlight or at late night. You will get 50 channel internal GPS to guide you through the waters safely. Pre-installed Unimap, showing almost every lake and rivers in the US, will provide you with an extremely accurate map and if you want to upgrade the chart or save waypoints, there is an SD card slot to transfer data easily. This fish finder is very reliable and compact, built with quality in mind. 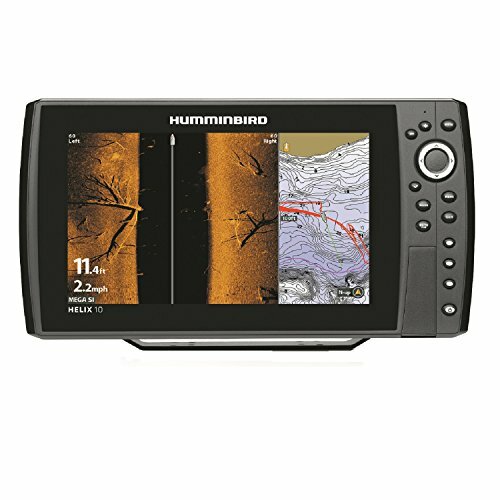 If you are looking for durable, efficient, waterproof fish finder that has awesome screen resolution and excellent sonar qualities, then the Humminbird 597ci HD DI might be your pick. Hummindbird knows what it takes to design a fish finder. They always deliver clear color picture in fantastic detail, and you can always count on the very informative sonar that always delivers lots of useful information. The fact is, the Humminbird 859ci HD Combo is unbelievably simple to operate with user-friendly menu that makes it super easy to navigate. Every setting is clearly described in the menu, so you will never have to read the manual. Basically, all you need to do is to have the device plugged in, power it up and you are all set. This unit contains a 7 inch LED backlight display that is among the biggest on the fish finder market. With the Down-Imaging technology, you are able to view the structure, objects and weeds in great detail using the high-resolution 480×800 pixel screen. Combining the Down-Imaging and 2D sonar technology you will have, at your fingertips, a complete understanding of all the activity and structure of the underwater world. With the power capacity of 4000W Peak-To-Peak and 500W of RMS output, will allow you to see clearly down to 600feet if you use broadband mode while you get 250 feet depth in Down-Imaging mode. The bottom line is that the Humminbird 859ci HD is easily upgradable to enhance your fishing experience further and make it a joyful ride, no matter if you are a novice or experienced fisher. It has intergraded GPS where you can see your exact location and you can pinpoint 1000’s of different waypoints. Those anglers that are looking for an efficient GPS and sonar fishfinder, with a large screen and extremely user-friendly operational features, then the 859ci HD is your perfect choice if your goal is to catch as many fish as possible! Giving you all the latest imaging technology, but without the extra investment of expensive and complicated features, the Lowrance Elite 5 CHIRP brings together the very best of sonar, GPS and DownScan-Imaging. With the fantastic CHIRP sonar technology, this fish finder is incredibly quick and efficient to identify bait while delivering increased target resolution as well as noise rejection. Featuring a high-res 5-inch color screen with 480×480 pixels resolution allows the Elite 5 to easily display what is taking place underwater. Included in this device is integrated GPS with built-in maps of over 3000 US rivers, lakes and coastal lines. The DownScan overlay is a technological innovation that works together with DownScan Imaging technology. What the overlay is capable of doing for you is to lay DownScan Imaging onto CHIRP sonar that will provides you with the sharpest and most detailed graphic image that you have ever seen in your life. The functionality of the DownScan Overlay is to combine the very best of the 2D sonar and DownScan imaging into one stunning graphical image. Basically, what we have here is a very simple to use fish finder with Nav+ maps included, top quality CHIRP sonar and very accurate GPS mechanism. 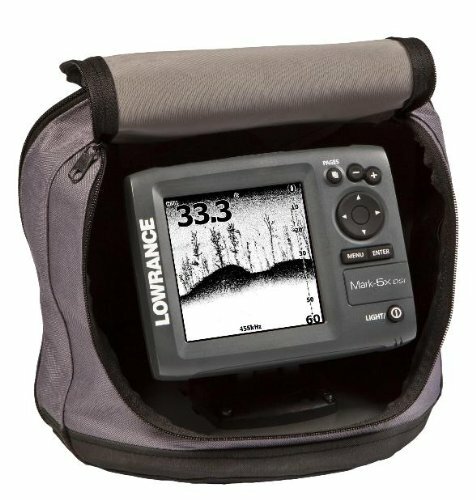 When you get down to it, you probably won’t find a better unit at this price range and of course you are completely covered with a 1 year trusted hassle free warranty from Lowrance. 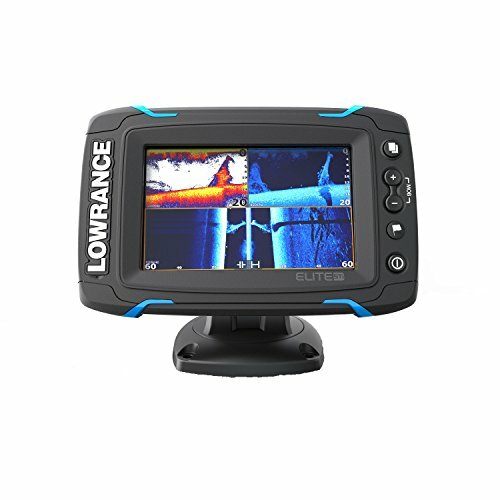 Lowrance has designed a brilliant fish finder device that delivers an impressive 800×480 pixel resolution in 7 inch wide screen and to make sure you will enjoy ultra-clear images from the 3D SONARS. We are talking about the great Elite 7x from Lowrance and seriously, just the display is well worth the price. The graphic and the way information/data are presented on the screen is just magnificent, and you will be able to view the screen in just about any weatherconditions. Featuring HD 455 / 800 kHz Sonar that allows you to choose 455 kHz for deeper imaging coverage and 800kHz for magnified monitoring of targeted locations. Additionally, it has the traditional 83/200 kHz that is very handy at high speeds and deep water. The Lowrance Elite 7x includes a built-in 16 channel GPS antenna and you have the option of saving up to 3000 waypoints, 100 routes or 100 waypoints per route. The unit is built around Navionics Gold maps, so you have almost all of the US waters at your fingertips. With the Track-Back feature, you are able to scroll back and check older GPS data and sonar history in case you want to revisit any spot that you marked down with the GPS or study the sonar reading further. Apart from the amazing screen, the great thing about this device is how easy it is to install. You will only have to connect two wires, the power source and the transom mounts. Therefore, anglers who demand premium quality screen and all-in-all a user-friendly fish finder with appealing price tag, should seriously consider the Elite 7x, plus you are covered by industry leading Lowrance Advantage Service program and a one-year warranty. Featuring a 250W max RMS and 30000W Peak-to-Peak transmission power, the Lowrence Elite 7 HDI ensures you can operate all the amazing features flawlessly. The Elite 7 HDI has a 7-inch color LCD widescreen display that will provide you a resolution of 800×480 pixels. That way, Lowrance is able to provide you with extremely clear pictures and with the LED backlighting you can perfectly read the information on the screen no matter if it is pitch black outside or bright sunlight. The device runs on a Hybrid Dual Imaging technology that works together with the BroadBand sounder. Using this technology, you can view the bottom, structures and fish activity in high resolution. Combining the BroadBand sounder and HDI technology, the Elite 7 HDI has become one of the top navigational tool and highly advanced fish finder device. Lowrance has also included GPS feature to navigate you safely through the water. With the GPS you can save any spot you notice that has any fish activity and then revisit that spot later on that day. In order to maximize the GPS capability, Lowrance has built the device to accept micro SD cards. With the SD card slot, you can upgrade your maps, download additional charts and transfer data to your computer. In conclusion, the Elite 7 HDI is built with high quality in mind and you’ll undoubtedly enjoy the amazing features and functions to the fullest extent. With the HDI technology, you will have a crystal clear, picture-like graphic of the activity under your boat that will enhance your chances of catching more fish. Additionally, Lowrance has one of the best customer services around and you will get a one year warranty if you experience any trouble operating the Elite 7 HDI. I hope that you will benefit from browsing through my fish finder website and read my reviews and articles. The information and guides that you will find on my website are intended to help you to make an informed decision and to make sure you will choose the right fish finder that will fit your fishing style and needs. At first, It might seem overwhelming and sometimes an impossible task to browse through all the fish finders out on the market because there are countless fishfinder manufacturers and models to choose from. There is also a lot to think about when comes to the final buying decision because you need to select a unit that will fit your needs and style. You can get easily distracted and demotivated when you figure out that you will need to dig-deep into technical terms of the fish finders features such as transducers, DownScan Imaging, sonar waves, flashers, echoes, transom mounts and frequencies. The bottom line is, when you are searching for the perfect fish finder, you need to have in mind the main purpose of a fish finder and that is to identify more fish effectively. You want to have a device at your finger-tips that shows you where to find fish and more importantly, helps you to catch it! To help with making the selection process easier and to help you to understand how fish finder works, I have put together this comprehensive Best Fish Finder Buying Guide and I really hope I can assist you to make the best choice. The first step to learn how to use a fishfinder is to understand how a fish finder works. The most important element that makes Fishfinders work is basically the sonar. Sonar is a technology that “shoots” sound waves down the water. For that process, the fish finder generates sound waves and the transducer shoots it down the water. As the sound wave travels deeper, it starts to form a cone (beam). The angle is measured in degrees and is referred to as a cone angle. When the sound wave hits the bottom or encounters any other object, it bounces back to the transducer. Now the fish finder is able to analyze the data and provide you with clear image on the screen, showing the objects, structures and weeds below the water surface. Basically, the fish finder works through the data gathered by the sonar beam and gives you the ability to get a view of how the bottom is formed and also every little thing it runs into on the way. It goes without saying that a wider angle, will of course cover more area. Therefore it is important to have in mind that different fish finder models will feature different cone angles and some units will feature multi-beam sonar that will even cover a whole lot wider area. Speedometer is something that is included in many fish finders. Speedometer will show you how fast your boat is sailing. This is extremely useful information to know because you might be sailing/travelling too fast. If that is the case, you will most likely scare the fish away from the area that you have found a lot of fish activity. Almost every fishfinder will provide instructions about what is the ideal speed for fishing in specific locations in order to increase your chances of catching fish. Location is important in fishing because you need to know where you are and where you are going. Those fish finders that offer information on location use the common Global Position System or GPS technology. With the GPS function, you are able to pinpoint your exact location on the water and chart the location where the boat is sailing. Temperature and pressure sensitivity is the capability of the fishfinder to enable you to identify precisely where the fish is located utilizing a temperature feature. Most of the advanced fish finders additionally include intergraded track-back capability if you wish to study the previous movements you made so that you can change location, while at the same time, you are fishing. Price is an important factor to bear in mind. The advanced and sophisticated fish locators out in the market today are not always pricey, but like with anything else, you will most likely have to pay more for prime quality. However, if you are a casual or maybe novice angler, you will find numerous fish finders that will suit you perfectly at a budget friendly price. The power is a vital feature that you should take into account before selecting the fish finder. The measurement for power in fish finder units is Watts (W). The higher the watts, the more effective and detailed results you will get. Also, higher watts will perform better in deeper waters and if you intend to use the device for shallow water, you can use less wattage (W). Lower watts, for example, 600W will work just fine in shallow water. However, if you plan on fishing deeper, you should get a powerful Watts unit. I would recommend over 1000W for deeper fishing. If fishing is your hobby, the main thing you need to think about the size of the screen. For beginners, there are many fish finder devices that include quite small screens. This is of course ideal for those who are looking for a portable device and something that could fit into your pocket on-the go. Those portable units are fine and will locate fish easily and fast but reading the data from a tiny screen might take some patience, especially if you are trying to read data in a bumpy water ride. Basically, fish finders come in all sizes. It goes without saying that a big sized screen will provide better and more detailed image than a device containing small screen. Echoes, speed, temperature, numbers and other data will be a lot easier to read on a bigger screen. Also, the price tag can vary significantly on a small screen device and a big one. Therefore, if you are on a low budget, then you might want to consider a small screen unit because they are relatively cheap when compared to big screen units. Since the display depends on pixels and therefore with more pixels resolution the display has, the more details you will see. However, more pixels will mean that you will have to pay more. You should note that the bare minimum is 240×160 pixels resolution so consider the pixels and have in mind that you will need to pay more to get sharpy and crisper resolution. It is more beneficial to get a color screen than gray-scale screen because with color screens you have the benefit of viewing echo data in different colors rather than just gray shades as you would with a gray-scale screen units. In general, strong/powerful echo will show stronger color. It’s also possible to go with either a color or black&white display. For those of you that are on a low budget, black & white fish finder will work without any problem. As I mentioned earlier, the advantages of a color screen are increased detail displaying millions of colors that will provide easy viewing of what is going on underwater. Transducer stands out as the most important part of the fish finder, just like the screen. The transducer is the element that transmits and receives the sonar signals that are then analyzed and interpreted on the screen for you to see visually everything underwater. If you want to get a fish finder that is accurate and useful, you will need to dig further into how much power and the type of transducer the unit includes because it will make a huge difference with regards to efficiency, accuracy and details of data that you can read from the screen. The power output of the transducer is measured in Watts (W) and kilowatts (Kw). When you scan through the product details of any fish finder, you will find references of “X Watts peak-to-peak” and “X Watts RMS”. Although this might sound confusing, it is quite simple to figure out. For example, if you divide peak-to-peak Wattage by 8 you will get RMS. The standard unit might include 1500W peak-to-peak whereas more sophisticated and advanced fish locator unit might include 2400W peak-to-peak. However, the difference in functionality and efficiency between a standard unit (1500W) and more advanced unit (2400) is calculated in 100s of yards. Additionally, you should know that, in case your device is not able to read the bottom structure, the fish finder won’t demonstrate any images of the bottom and you will have no information about how the bottom is formed or how deep it is to the bottom. The most important feature of the transducer and the part you need to be on the look-out for, is the cone angle. If you want to be able to cover a bigger area, you will need to select a fish finder that offers bigger cone degree. The wider the beam, the more coverage you get and therefore higher chances of catching and locating more fish. Keep in mind though that it can quickly lose its strength. For this reason, it can’t reach as deep as a device that offers a narrow cone angle. With a narrow cone, you are able to go quite deep and narrow cone angle will work better at greater depth and it will also give great details on the underwater activity and structure in shallow waters too. The commonest frequencies you will find in a fish finder are 200 and 50 kHz. Ranging from a stand-alone frequency to a more preferred combination of both 200 and 50kHz. In general, for deeper waters, 50kHz will get the job done because low frequency will provide enhanced transmission through the water. Keep in mind, that the disadvantage is that a unit with a 50kHz transducer will provide you with only around 25% of data of a 200kHz fish finder. Preferably, if you are on the lookout for bait in deeper waters, you should consider getting a 200kHz device. When you are picking out the ideal fishfinder that fits your preferred fishing style, you should select the device containing the right frequency because the frequency is precisely linked to the cone angle. The great thing about modern fish finders is that you can now get units that offer single, dual and multiple frequencies, offering you variety of selections to match your fishing style. Generally, you will find these frequencies on most of the transducers 50kHz, 83kHz, 192kHz along with 200kHz. Fish finder with higher frequency (200+) will provide more detail of activity and structure underwater. Yet another awesome feature, to help you catch more fish, is the DownScan Imaging. The majority of the leading fish finder producers use a breakthrough technological innovation that runs on high-frequency sonar that is ideal for shallow waters. However, when you are fishing in shallow waters, you will enjoy astonishing graphic images of everything below your boat. Put simply, using a traditional sonar reading, you will for example, see a tree or plant as a dot or bunch of dots together but with DownScan technology, a tree/plant would show up as a picture-like tree/plant. A Fish finder with the Side Scan technology will fire the signals down to the sides in order to greatly enhance the search area. Basically, the Side Scan technology can be described as a groundbreaking concept that will help anglers to clearly see what is hiding to the side of the boat. With these graphical-like pictures you are able to cover huge amount of area to the left and right of your watercraft, most of the time up to 240 feet each way to the side. By having SideScan, you will save hours of capturing and analyzing data, sailing through the same area with a transducer that only fires the beam downwards. You will be able to see everything, even in dirty and dark waters. On your screen, you will have clearly displayed structure, objects, weeds and even objects that you never knew could be hiding down there. Having the SideScan offers great benefit to any angler because it will help you scan more area in greater detail and therefore provide you with the opportunity to catch much more fish. The GPS feature is a useful addition to your fish finder device and the GPS capability can be thought of as a safety feature, to get you home safely. The GPS has also more advantages like the ability to save 1000’s of waypoints. You are able to easily pinpoint your location, mark you way home or save any spot to revisit later on. With GPS you can also install lots of different charting packages that will add more joy and convenience to your fishing by providing you with impressive details, accuracy and reliability in mapping. In case you are fishing on a big lake or far into the ocean, you should be equipped with GPS, mostly for safety reasons. Some of the more experienced anglers have two GPS, using the second unit as a backup. Another benefit of having two GPS units is that you can setup different charting packages in each unit. For instance, you can setup one to show routes and the other to show underwater structure. Most of modern fish finders include so called “GPS COMBO” units which means that GPS is integrated into the fish finder. Most anglers prefer to have a GPS Combo while fishing because it offers by far the most functions and also, the combo units are getting extremely budget friendly. The basic fact is that a GPS Combo Fish Finder is a lot cheaper than buying two different/separate devices and you’ll find it offers the exact same technological advances and popular features of both. Basically, adding a GPS element in a fish finder is actually a massive upgrading because by using the Combo you will be able to identify fish and fishing spots very quickly and of course, safely navigate you back home. If you know your fishing area like the palm of your hand, then you maybe don’t need a GPS Fish Finder. However, it’s always best to be safe than sorry, so consider adding GPS for safety and also many other great benefits like I mentioned above. The GPS will calculate your exact position and you have the option to save waypoints and charting options are basically endless if your device is GPS compatible. It is worth it to upgrade to a GPS Combo, in case you are looking for a GPS unit. The Combo feature is practical and you don’t have to be carrying around two units so you will definitely save space and money by having GPS intergraded. This way, you will enjoy many benefits such as having the ability to pinpoint active fish hot-spots and revisit them later on. These pinpoint spots are referred to as waypoints, and you will be able to save 100’s or even 1000’s of different waypoints. I strongly recommend investing in a GPS unit, as you will be able to navigate through the waters easily . Not only because of that but most importantly, it will offer you some safety. Regardless of where you fish, if you are equipped with GPS Combo, you’ll be certain that the GPS will help you to navigate back home safely. In some cases, you might be fishing in many different locations where you could easily lose track of your location. Maybe you might even lose sight of land, not to mention in sudden change of weather you might get lost quite easily. However, with a GPS unit, you will get a precise waypoint on how to get home, how long it will take and how far it is to base. There are many benefits of having GPS Combo Fish Finder. You have the advantage of being able to chart your course, or in other words, pinpoint your exact current location and chart your desired way to any other location. The GPS Combos are already installed with detailed information on all US lakes, rivers and coastal areas. Additionally, you are able to save locations. This feature is extremely useful for anglers that want to save any location and revisit them later on. This might include areas where you might stumble upon a hot-spot with a lot of fish activity and a place where you would like to come back to later that day. GPS units will allow you to save 1000’s of different waypoints. Another useful element is a depth finder. This feature will become extremely useful when you are on the lookout for any fish that likes to hide deep down. The depth finder will display how deep the water is around so you can navigate to the deepest area of the water in search for the bait. Finally, the water temperature sensor is a neat little option that can found on many GPS Combo Fish Finders out there. With this feature, you will be able to see on the screen the thermocline or the exact location of where the cool and warm waters meet. If you are able to identify the thermoclines, you will have an idea where the deeper areas of the waters are located. Almost every Fish Finer GPS Combo out there have the GPS built-in. However, some of them will include external antenna. All of the GPS devices will come out-of-the-box preloaded with charting packages. If you want to upgrade your charts, for your specific needs, you can use a SD Card to download the upgrade and transfer to your device. Well, now you have decided to invest in a GPS combo but with so many different charting packages, lets now look at the most favored packages and what they have to offer. Below, you’ll find the most favored charting packages available today. BASEMAP is the most basic and easiest to use map of the US. Since they only offer the most basic data, don’t expect to be able to read data on depth, contour or any other additional information. What you will get here is basically information that will show you what is water and what is land, that’s about it. ContourXD is the more advanced variation of Basemap and is usually pre-installed on Humminbrid devices. With ContourXD you are able to read depth, contour lines, lights and a lot of other useful information. Navionics Gold is one of widely recognized and most favored chart package that you can find, mostly pre-loaded on Lowrence devices. With Navionics Gold you will have plenty of valuable information such as data on depth, currents, contours, port plans, tides and many other useful information. BlueChart g2 Vision is the Garmin’s edition of the Navionics. It is a little bit more advanced than the Navionics and features Auto-Guidance technology. With Auto-Guidance you just enter any route into the map and the device will instantly provide you with the fastest and safest route depending on the size of your boat. What makes the BlueChart g2 Vision stand out in charting packages is the detail 3D view of the land, shoreline and ports, Lowrance Lake Insight is another leading edge charting package. With stunningly detailed maps of over 6300 US lakes, rivers and shorelines, offering more than 200000 ways of saving your pinpoints and also the state of the art HD shaded relief and detailed contour lines. Another factor to bear in mind during the fish finder selection process is if you should go for a portable unit or a fixed unit. A portable fish finder, which you can fit in the palm of your hand, will be easy to move around and store in your pocket while a fixed device will require you to mount the device onto your boat. The portable fish finders are more practical in terms of mobility, but they come with a catch. Those devices are very basic and offer basic usage. They are great for anglers that rent boats or those who fish on the shore line and need something that is very convenient and portable. However, you probably won’t have all the sophisticated features as the fixed ones, but the portable units will of course help you to find fish quickly. Most of the portable models come with their own carrying case and a battery that you can just put continently in your pocket after use and also they include transom mount for quick and easy installation. The portable products have their transducer attached to the transom (with a suction cup). Those of you who are more experienced anglers and those who own any type of watercraft, a fixed unit is the absolute must because you will be able to mount anywhere you want on your own boat. That will give you the option to use the device according to your needs as you would mount the unit on the trolling engine, stern or hull. Since I just mentioned the portable vs. fixed unit, it is important to cover the needs of those who love kayak fishing, and those needs are pretty specific. You hardly have any space in your kayak compared to a full watercraft. For this kind of fishing, you will need something reliable, light, waterproof and efficient. You need something that you can count on while you are rowing without worrying about the functionality of your fish finder. You need something that is so light that it won’t affect the weight of your kayak because the heavier your kayak is, the harder it will be to row. The benefit of using a kayak in fishing is the ability to silently row towards the hot-spot without scaring the fish away. You need to consider the portability and the portable options of a fish finder. Just like I mentioned here above, you need to make sure that your fish finder is portable enough to fit on your small kayak. Preferably you should invest in a single unit, without any external parts because having all the extra parts will make your kayak heavier and complicate to operate. For example, it will only make things more complicated if you go for a transducer that has to be installed apart from the main unit. An important feature to have in mind for kayak fishing is GPS. It is important to know where you are located when you are on your kayak. You can easily get lost on a kayak and it is pretty hard to row your way around without a motor once you find yourself lost. GPS is an important safety feature that should be a standard in your fish finder because the ability to know exactly where you are at all times is essential to help you return safely home from an emergency. I hope after browsing through the fish finder reviews that you won’t have to look any further to make up your mind about which is the best fish finder that will fit your fishing style and needs. Above, you should be able to discover a range of analysis that includes the industry leading fish finders available for purchase. With my fishing experience and my independent way of reviewing the fish finder products, I’m certain that I can provide you with enough information so you can make an informed decision about what fish finder will suit you best. All of us have different fishing styles and needs and all factors has to take into account before you invest in a fish finder device. That’s why I have reviewed and analyzed every angle of pros, cons, features and what to expect, so you will be informed and prepared to choose a fish finder that’ll trigger improved efficiency and most of all enjoyment while you fish. While comparing fish finders, think about your budget and have in mind the features you want the fish finder to include. Are you looking for a portable unit? Fixed unit? GPS combo or a single unit? Big screen unit? Touch screen unit? All these possible fishing factors are considered in my reviews. Hopefully, after reading the reviews, you will be able to find your perfect fish finder, catch more fish and most of all, take your fishing to a whole new level. Fish Finder Buying Guide: How Does It Work? Expensive or Cheap Fish Finder: Which Is Better?